The board and cards are setup in the same way as the standard game. You will use either a shared deck with your partner (standard 20 card deck). 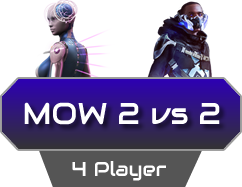 Each player will draw 2 Faction cards to begin the game (not 3 as in the standard version). The main difference between 1 vs 1 and 2 vs 2 is that the turn order is different. Once you have completed the draw to see which team will go first, each team must decide which partner will go first in Round 1. This player will lead off for each team and their partner will be finishing the game in Round 8. It’s a critical decision and you are allowed to see your Faction cards before making this decision. For the following example, Team A is the team who has chosen or been asked to go first. Team B is the team that will go second. During the first round Player 1 from Team A will start the Round. Once they have completed all their actions and the End of Turn card has been played, Player 1 from Team B will begin their turn. At this time, Round 2-7 will be played by individual teams in a back to back format. Team A will be playing Round 2, 4, and 6. Team B will be playing Rounds 3, 5, and 7. In Round 2, Player 2 from Team A starts the round followed by Player 1 from Team A. In Round 3, Player 2 from Team B begins the Round and then Player 1 from Team B completes the Round. And Round 8, Player 2 from Team A plays the final turn for their team followed then by Player 2 from Team B ending the game with their play (unless their are End of Game Round Effects to complete). In an alternate version, if you want to make things a little more interesting, each player may have their own faction deck; do note you are less likely to draw Legendary and Epic cards in this format. However, certain cards from different factions can be very interesting when mixed together. If a card requires you to choose a card from the opponent’s hand, you must choose 1 of the 2 players’ hands first. The following cards are not allowed to be chosen when playing a 2 vs 2 game. To achieve more points than the opponent side of the board after 8 turns of play. 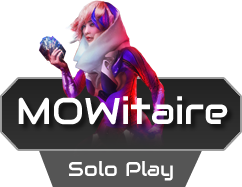 Mowitaire is an awesome way to play solo, practice your combos and most importantly is also a super catchy name! The game rules below provide you the basic on setup and game play but we encourage you to up the level of challenge if you find yourself winning it often. Build a Standard faction deck (hint: build one that is not only entirely offensive but also there is not really a need to mess with opponent Faction plays) consisting of 2 Legendary, 5 Epics, 5 Neutrals, and 8 to 18 Actions. 15 cards into “opponent’s” Ally row, 14 cards into “opponent’s” Loyalist row, and 13 cards into “opponent’s” Recruit row. 17 cards into “opponent’s” Ally row, 16 cards into “opponent’s” Loyalist row, and 15 cards into “opponent’s” Recruit row. 19 cards into “opponent’s” Ally row, 18 cards into “opponent’s” Loyalist row, and 17 cards into “opponent’s” Recruit row. Then deal 6 cards into the Afterlife and 8 cards into the Neutral Community area. You now have 8 turns to achieve a higher score than what the “opponent” has at the end of the game. 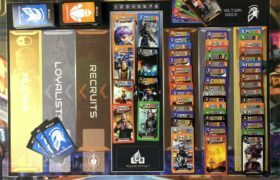 Use movements and Faction plays to take as many points as possible from the “opponent” while adding points to your side of the board. Anytime a card says opponent may choose a card, randomly draw from what they would choose from. For example, if you were to play Steel Moonfall where the opponent would normally get 1 neutral area card, instead shuffle the neutral area and randomly draw 1 card and place in “opponent’s” Recruit row. 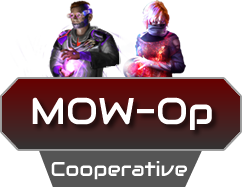 This is a cooperative play where you and a partner will attempt to push points to BOTH sides of the board in order to beat a pre-defined score for each Round. For example, in Round 1, both players will attempt to achieve 20 points on their sides of board in order to pass the Round level. If you do not achieve the minimal points on BOTH sides of the board, you lose. This game variant is super fun but will require a pen/pencil and paper to keep track of scores as you move forward throughout the game. Shuffle Community deck and draw 2 cards to see who will go first. Place drawn cards in the Afterlife. Each round, you and your partner must move the minimum number of points to both sides of the board. For example, if Round 1 minimum is 20 points, you will need at least 40 total points, 20 on each side in order to pass the Round. At the end of Round 1 both of you must have 20 points on your side of the board. At the end of Round 2 both of you must have 45 points on your side of the board. At the end of Round 3 both of you must have 70 points on your side of the board. At the end of Round 4 both of you must have 100 points on your side of the board. At the end of Round 5 both of you must have 130 points on your side of the board. At the end of Round 6 both of you must have 160 points on your side of the board. At the end of Round 7 both of you must have 195 points on your side of the board. At the end of Round 8 both of you must have 240 points on your side of the board. If at the end of any Round either player does not have the set amount of points on their side of the board then the game is over and you have lost. There are a few major variations that can drastically increase the difficulty of the game. You may adjust the points for each Round to increase or decrease the level of difficulty. Do this prior to the game starting. Using +5 (-5) Lasting Effects can make the game much easier to pass Rounds. In this game however , you will track the +5 values at the end of each Round so that you may pass the level. This is why you should write the scores down Turn by Turn to make the tracking of scores easier. Alternatively, you may choose not to use the +5/-5 cards but the level of difficulty will increase significantly. 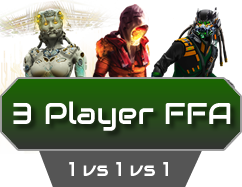 This variant plays almost identically to the standard 1 vs 1 game. The objective is to beat 2 opponent’s rather than just 1. You will either need a second game board or you may use a handmade third row going down from the Round Effects area of the main game board. It’s simply adding a third Recruits, Loyalists, and Allies rows. Set the board up as normal, build a standard deck (2 legendaries, 5 epics, 5 neutrals, min of 8 actions), and all 3 players draw to see who goes first. The player who draws the high card can choose to go first or pass to the next player in clockwise order. That player then can either go first or pass to the last player who then must go first. For the rest of the game that is the turn order (unless changed during the game). If in the event a tie occurs during the draw, only the players that have the same value draw again. There are now 3 turns per Round and the player who plays last will change to Round marker after their play is completed. When you choose a Starting card with negative movements, you may choose to move the card towards either opponent’s rows. This is the main difference in the game play. You must balance the points for both opponent’s being careful not to give one opponent too many points. If a card has a penalty for its use then any and all players affected by the play will gain from said penalty, if just one opponent is affected then only that one will get the bonus. 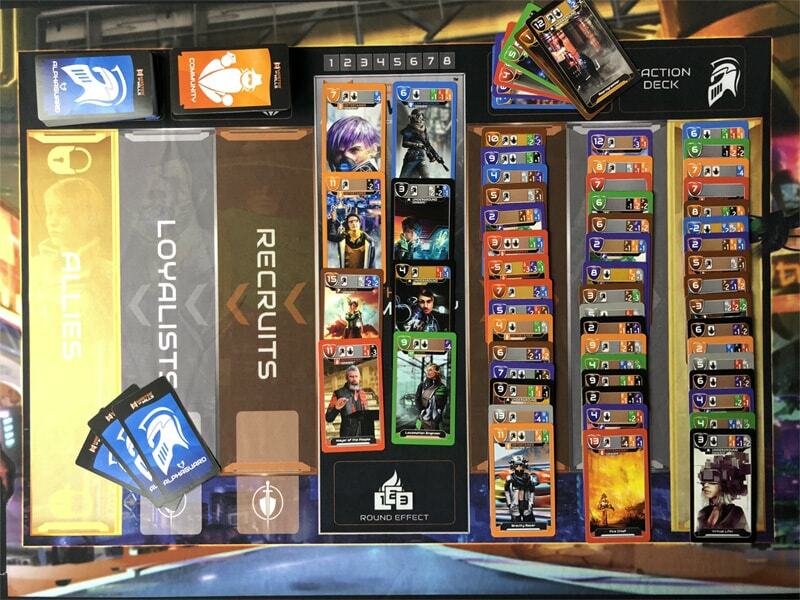 For example, if you were to play The Loyal Gentlemen you could move 1 Recruit from each player but both players would then get 1 neutral area card to their Recruits; or move 2 from only one opponent and then only that player gets 1 neutral area card.